The Kids Box is designed to help your child age 3 – 5 improve and enhance their core skills through art, games, science, songs and rhymes. Between the ages 3 – 5 your child continues to learn at a rapid rate. Their mind is like a sponge! Absorbing ideas and learning new concepts every day as they explore and investigate their world. As a parent, by providing them a variety of activities at home you enable them to develop both their mind and their body, helping to ensure a balanced and well rounded child. You child will develop the skills necessary for critical thinking through hands-on activities done in a familiar environment – with you (or a helper) in your home. 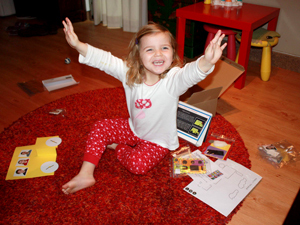 How do our Kids Boxes help you? Have any questions about the Toddler Box? Just give Julie a call at +852.2818.2278 and she can help you.